The picturesque town of Gatchina situated 46 km to the south-west from Saint Petersburg is well-known all over the world. The unique palace and park ensemble listed among the masterpieces of landscape architecture was created by the generations of the talented artists, architects, designers and gardeners who turned this place into a magnificent work of art without disturbing its natural beauty. The first country mansion was established in Gatchina in 1708 and was endowed by Peter the Great to his sister Natalya Alekseevna. After the tsar's death the mansion had changed several owners until it was bought by Catherine the Great in 1765. The generous Empress presented Gatchina to her favorite count Grigory Orlov. He appreciated the gift and invited the best Russian and foreign architectures to create a palace and a park in Gatchina. The first palace, designed by Antonio Rinaldi, took shape of a hunting castle with towers. The underground passage was constructed. Along with the palace, the Cesme Obelisk commemorating the glorious victory of the Russian fleet over the Turkish in 1770 and the Eagle Column honoring the count (as the family name Orlov can be translated as «eagle») were erected. The park was laid out in English style according to the latest fashion and became the first landscape park in Russia. After Orlov's death in 1783 the Empress bought the palace from the count's heirs and presented it to her son Paul, the future Russian emperor. The new owner reconstructed the residence according to his taste and, as a result, the mansion more closely resembled an army camp. At the instance of the future Emperor architect Vincenzo Brenna reconstructed the palace and made it look like a medieval fortified castle with bastions, moat and draw bridge. 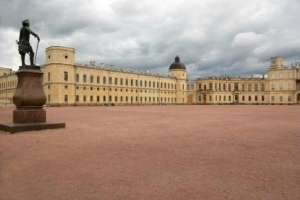 The meadow in front of the palace was turned into a parade-ground where troops of Gatchina dressed and trained in Prussian style marched from morning till late into the night. When in 1796 Paul ascended to a throne Gatchina got the status of a town and along with it acquired its own coats of arm. The Gatchina Palace became the main imperial residence of Russia. The situation didn't change with the death of the tsar as well. In 1851 on the parade-ground in front of the palace the bronze monument to Paul I designed by sculptor Vitali was erected. Gatchina played an important role in the history of Russian aviation. It is there at the beginning of the 20th century the first aviation school was opened and on the so-called Military Field first air shows took place. After the revolution of 1917 the palace and park ensemble of Gatchina was nationalized. Luckily, it wasn't plundered as other Russian mansions but turned into a museum. When World War II burst out most works of art that formed the collection of Gatchina Palace were evacuated. But in spite of all efforts to preserve the unique ensemble Gatchina didn't escape destruction and devastation. In 1941 Fascist troops entered Gatchina. The town was ruined, the palace was burnt, the trees of the landscape parks were cut down, and the pavilions were blasted. The restoration works started soon after the end of the war and lasted for several decades. Only in 1985 the palace and the park were reopened to the public.